The name Blue Black appears in the catalogs of artists’ colormen circulated in the nineteenth century. Some references describe it as charcoal black, which may have been derived from charred vine cuttings or wood charcoal. It is often listed as a mixture of 40 parts bone black and three parts Prussian blue, which is the composition of Rublev Colours Blue Black. 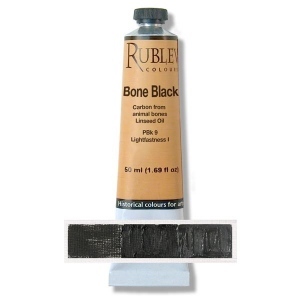 Rublev Colours Blue Black makes very cool black tints with good tinting strength, fine grained and produces ‘short’ brushstrokes.